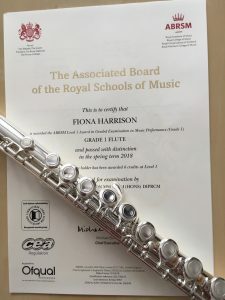 Some of you will know that I took on the challenge of taking a grade one ABRSM flute exam this Spring. Not having played the flute before, I thought it would be hard, but not so incredibly difficult! 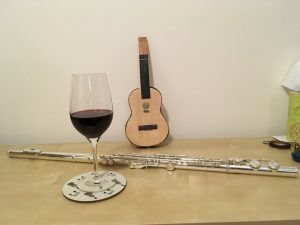 The whole process of learning an instrument from scratch has refreshed and helped my understanding of being a student again, in more ways imaginable. Not only did I learn some flute basics, but I learned what it’s like to be a beginner. Joy at simple things, fantastic to play famous music by major composers, out of control and discouraged at times, in disbelief when in lessons, my amazing playing sounded as if I hadn’t practised at all. There was difficulty establishing a basic practice routine and I really did need those positive words of encouragement to help me through. My first lesson was prior to Christmas. Absolutely great fun. Loved all the different repertoire, learning how to pack my flute away in the box, learning about tongued and slurred scale requirements, being able to play music with cold hands and without having highly polished nails. Glorious! I soon found out what it was like to be a learner and not just a teacher/performer. I had anticipated difficulties in breath control but had rather thought that being both a musician and teacher, I would address these issues in a mature, considered and professional fashion. I didn’t. I did enjoy a glass of wine though. Christmas came and family commitments meant that the flute got side-lined. I did however enter myself for the ABRSM exam as a goal. Confessions began. I confessed to my teacher that I hadn’t practised due to festivities so we started again. My teacher was great about it and focussed on the reasons why I became dizzy in lessons and spent a lot of time gasping for air. Essentially, the essence of the lesson was, if you want to take 26 hours getting from A-B carry on with what you’re doing, but, if you want spend only two hours of your time getting from A-B, do it her way! Simple! Except it wasn’t. My teacher didn’t focus on the Verdi and Scott-Joplin I had been wanting to learn at the time I entered myself for the grade one exam. My motivation took a dive. She focussed on breathing and everything I found difficult about it. 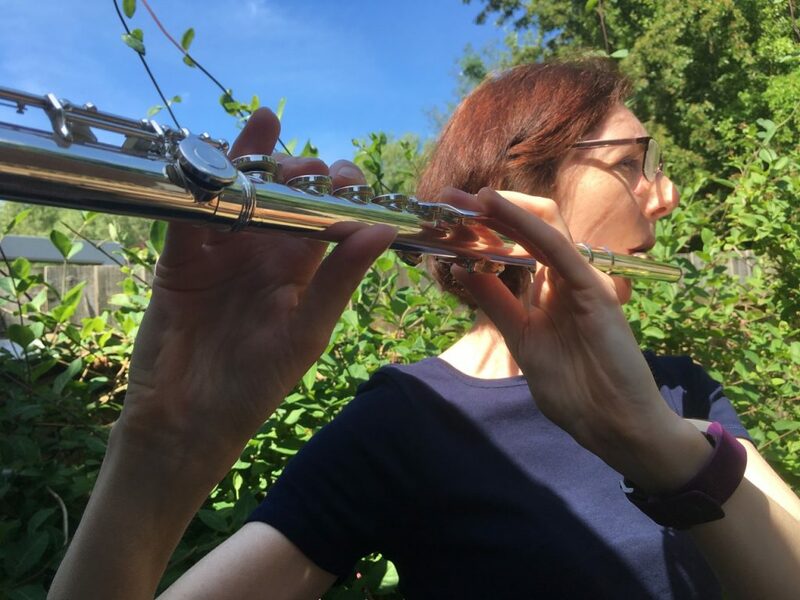 (Good, or even adequate, flute playing is all about breath control.) Instead of practising what all music teachers boringly preach, (including myself) “break things down into small manageable chunks and do a little at a time”, I put my flute in its box and didn’t take it out for 4 weeks. If I couldn’t play Verdi without having to do all of those difficult breathing requirements, I wouldn’t play at all! Self-sabotage. By the start of February, I realised that time was running out for a March exam deadline. I needed to change my mind-set, book a lesson and confess lack of practice to my teacher. Uttering the words, “I’ve practised twice since the last lesson, although one time was in my head on an Easy jet aeroplane, flying to Italy,” was simply embarrassing. “It doesn’t have to be perfect”. With 28 days to go before the exam, I wrote out a simple schedule. Scales, tongued then slurred, arpeggios, tongued then slurred. Piece 1, piece 2, piece 3. Everything had to get a tick each day. The tick meant I had tried. The tick didn’t mean perfection. 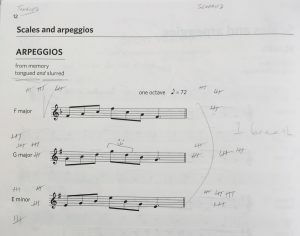 I put marks over the bars that needed practising – and rather viewing these bars as bits to be avoided, because, let’s face it, they sounded dreadful, I soon started to tackle them every day. They got a tick for a day of trying. Even if I practised them badly, with no noticeable improvement, only once. Tick. Next day – I was always encouraged by the positive re-enforcement. The ticks looked good even if the sound was still horrid! When playing the pieces with my teacher accompanying me on piano I realised that I hadn’t actually heard much of what she had played, probably beautifully. I was way too focussed on my part. That was weird! I normally Always know what’s going on! I realised that when I accompany my pupils on guitar, they must feel like this sometimes as well! Finally getting into the routine of daily practice was a great feeling. Multi-tasking cooking the evening dinner and practising the flute occurred most days. The inconsistency of my tone really annoyed me, sometimes it was good, sometimes it was ridiculously poor, but it all improved over time. Progress became rapid, motivation was high, the sound of the flute on a good day was actually rather nice and I started to really enjoy what I was doing. End of March 2018 and exam day arrived! I was so nervous! About everything. Even – aural tests! Nerve-racking! I felt for all my students that have already taken exams or who will be taking exams in the future. The wait for the result felt way longer than I had expected too. A lot of fingers were crossed.As it happens, those 28 days of intense, focussed practice, often twice a day, paid off. I passed! and was chuffed to bits. All those dizzy spells from lack of oxygen had been worth it! But what did I learn!!? Take yourself out of your comfort zone once in a while and enjoy a challenge. Get yourself a teacher and go for a lesson even if you have to utter confessions of not having practised. Your teacher is there to encourage you and can get you back on track with fun and enjoyment. Don’t expect perfection! And don’t be too hard on yourself! Practise regularly. Find a time that works for you on a regular basis. It doesn’t have to be a perfect or optimal set-up. Just get going! Reward yourself lots – pencil ticks/ stars/ stickers, an inward smile of achievement, inner self–congratulation – whatever it takes. Realise that there is no quick fix to things you find difficult, just do a little each time you pick up your instrument. Little and often. If you have any music that you particularly enjoy – sneak a bit of that into your practice! It might not make the Wigmore Hall, (or make your teacher happy) but it will help you weather the dispiriting moments and keep you remembering the reason why you picked up the instrument in the first place! Enjoy the vast array of textural and tonal possibilities our amazingly beautiful instrument has. Good luck with your own guitar playing! 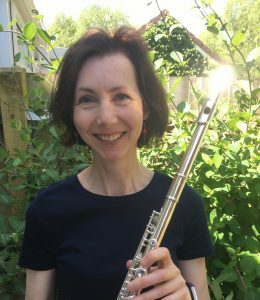 If there’s anyone in Dorking/ Surrey who wants to learn the flute, my very patient and very wonderful teacher was Andrea Charles. She comes highly recommended.